Home Engineering Entrance Exams HITSEEE 2019 Application Form – Last Date Extended! The HITSEEE 2019 application form has been released by the Hindustan University on 5th December 2018. The HITSEEE Application form 2019 has been released in the online mode as compared to previous years where application form was available in offline mode. The application form is available in both online and offline mode. Candidates can check the application form that is available starting from 5th of December 2018 till 20th April 2019. Those who wish to appear for HITSEEE 2019 must make sure to check the eligibility criteria and then fill up the online application form. HITSEEE 2019 application form available Now. CLICK HERE TO APPLY. What’s New in HITSEEE Application Form 2019? The HITSEEE 2019 Application form is released in the online mode as compared to previous years where application form was available in offline mode. Candidates can check the application form that is available starting from December 5th, 2018. Those are filling out the application form of HITSEEE 2019 must make sure that they have read the procedure given below carefully so that they can fill out the form easily. Register Yourself – Candidates must register themselves on the official website through the link provided here. A page will appear where candidates will be required to enter the basic details like their name, email Id, date of birth, course preference, enter the captcha code, and click on submit. Fill the Application Form – Candidates will be required to fill up the application form with the personal, educational and other details. Select two test cities centers in which you desire to appear as per your convenience. After entering all the details, candidates must click on submit and proceed to the next step. Upload scanned Images – Candidates have to upload the scanned images of their photograph and signature according to the given specifications. Candidates must upload the correct images and click on save and continue. Preview the Application – After the form has been filled, candidates must preview the application form and check for any mistakes. If there are any mistakes that need to be changed, you can always go back and do the necessary corrections. Make Payment – The next step is to pay the application fee in online mode through Credit/ Debit Card. Read all the instructions and click on “click to pay”. The Application fee is expected to be Rs. 925 like previous years. Registration Slip – After the candidate has successfully paid the application fee, candidates will be able to see the provisional registration slip. The candidate must download the slip and preserve it for future reference. Download the form that is available on the official website and takes a print out of the form. After filling up all the details, candidates must make sure that they affix the passport size recent photograph with the white background on the particular space. Ensure that your photograph contains name and date. The application form must have the candidate’s as well as his/her parent’s signature on the application form. After filling up the form with all the correct details, candidates must submit the Application form via post on the address of HITS. 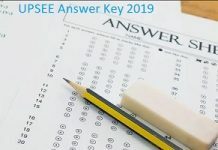 The HITSEEE Application form 2019 has been released, and therefore candidates must make sure to make a note of all the events related to the application form and its dates. For B. Tech (Bio-Technology) alone candidates must have passed (10+2) with a minimum average of 60% marks in Physics, Chemistry & Mathematics. Applicants who are filling up the application form must provide the preferred exam city/center. Candidates can check the HITSEEE 2019 exam center in the table provided below. 3 What’s New in HITSEEE Application Form 2019?